Come visit us if you are you looking for a peaceful and energizing vacation in the beautiful hills of central Italy. 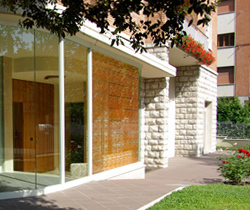 Located in the proximity of downtown Perugia, the hotel is surrounded by a garden. You’ll be hosted in charming, spacious and tasteful rooms, each with a large private bathroom. The exquisite design of our rooms is creative and original. Completely handmade, the furniture of each room was realized by a local carpenter using cherry wood. Each room is dedicated to well-known artists and decorated with their most famous paintings. Therefore, you could sleep in the Picasso, Kandinsky or Monet room. Every room is equipped with clean linens, mini-bar, individual heating and cooling systems, telephone, in-room safes for personal effects, large wardrobe, hair dryer in the bathroom and Wi-Fi internet connection. The rooms are especially quiet and peaceful due to special sound-proof windows. A special room was designed for disable guests, easily accessible and comfortable to move with wheelchair, as well as equipped with a large bathroom. For your convenience, all rooms are accessible by elevator or stairs. The hotel is also equipped with a private garage where you can safely park your car. The breakfast room is charming and cozy, a beautiful, sunny winter garden, surrounded by glass windows; a real greenhouse-like space, where to enjoy a typical Italian breakfast. You will love our Italian espresso, cappuccino, biscotti and handmade breakfast cakes, as well as more traditional continental breakfast. Gluten free breakfast for celiac people is also available upon request. We are always available to answer your questions, providing suggestions to explore the area and enjoy the variety of the cultural, natural and gastronomic Italian offerings.